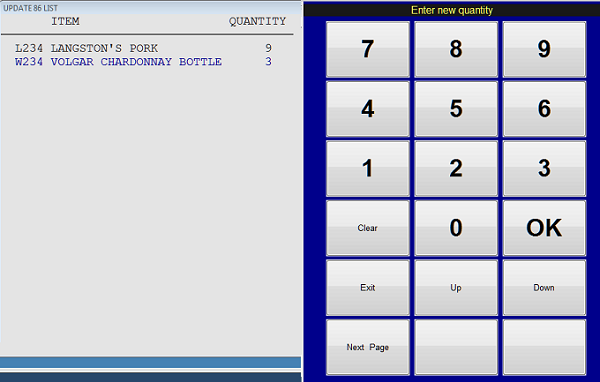 From the Table Selection screen (in Fine Dining mode) you can access the Supervisor Menu from the "Main Menu" button. 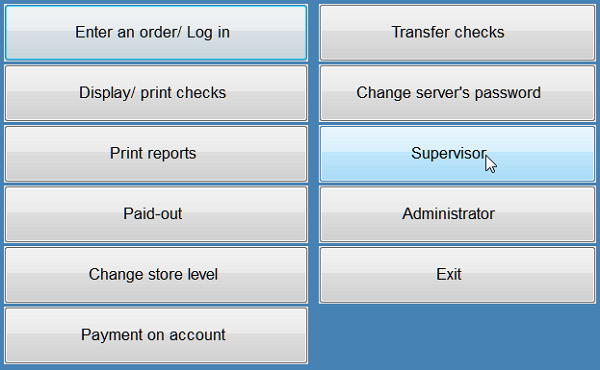 In Retail Mode you can access the Supervisor Menu from the keypad by selecting "exit". 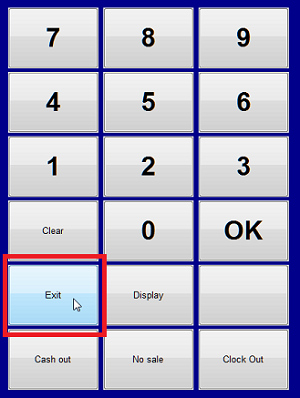 If the keypad does not display when you log in or if you are already past it, you can access the Supervisor Menu from the "options" button then "Exit Check". End of Day should be run after all POS outlets have closed for the day and after everyone is finished closing checks, etc. It should be run only once per day. It will run for all stores/companies. 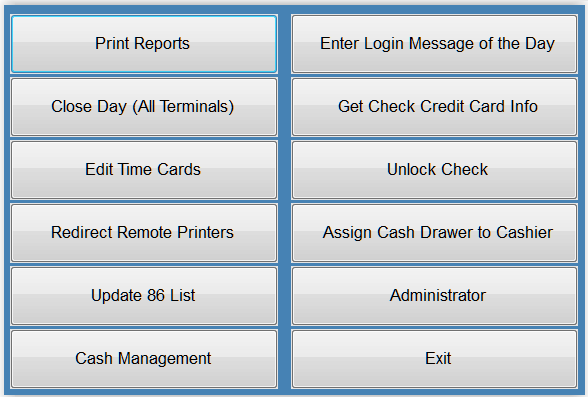 All POS workstations should be at the login screen or logged completely out of Execu/Tech and at the desktop. If you have a hotel, you should do POS End of Day Close prior to Night Audit Reorganize Files. Before starting, make sure there are no open checks. Go to Display Checks to make sure. It is a good idea to print a Cashier Report prior to running End of Day although a Final Cashier Report will print when EOD is run. Go to Supervisor Menu and select #2 Close Day (All Terminals). A message will notify you if employees are still clocked in (if you are using Time & Attendance). A message will notify you if checks are still open. You should NOT answer "Yes" to continue closing. You should close or void the checks. They cannot be closed or accessed after End of Day has been run. 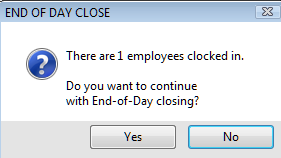 If you answered Yes to continue closing even if a check is open, a popup will make SURE you want to do this. A message will notify you when End of Day has completed. 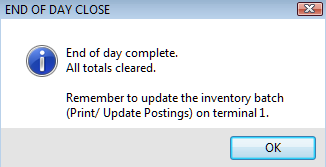 The message will remind you to update the inventory batch (if you are using Inventory Control) and will let you know which terminal the batch is on. By default the inventory batch will be located on the computer running POS End of Day but can be changed via the MENUINI configuration. 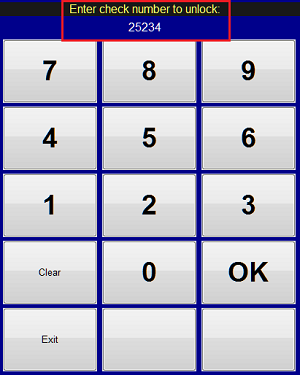 You can find the Terminal Number by looking at the bottom of the main Execu/Tech screen if you are logged on with the POS menu. 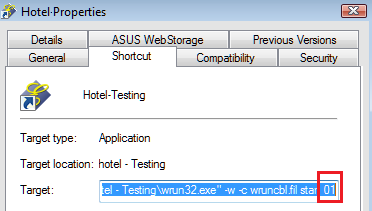 You can find the Terminal Number by looking at the Target line of the shortcut from which you accessed the software. You can find the Terminal Number at the bottom of the POS login screen. Remember not to run End of Day more than once per day. If you get an error during End of Day Close, please send a screen shot of that error to Execu/Tech support. Items that are limited or not available can be placed on the "86 List". You can increase or decrease the quantity available. As the 86-List items are sold, the available quantity will decrease until the quantity is 0 (zero). When the quantity is zero, the item will not be available to sell. When you select "Update 86 List" from the Supervisor menu, a list of items on that list will display with the current quantity. Select "move up" or "move down" to select the item to change. That item line will turn blue, as shown below. Enter the new quantity followed by OK. Select "exit" when you are finished. To place an item on the 86 List, go to "Menu Items" in POS Administrator and answer "Y" to field 15, "Item in 86 List?". A prompt will allow you to enter the current quantity available to sell at the time of setup. 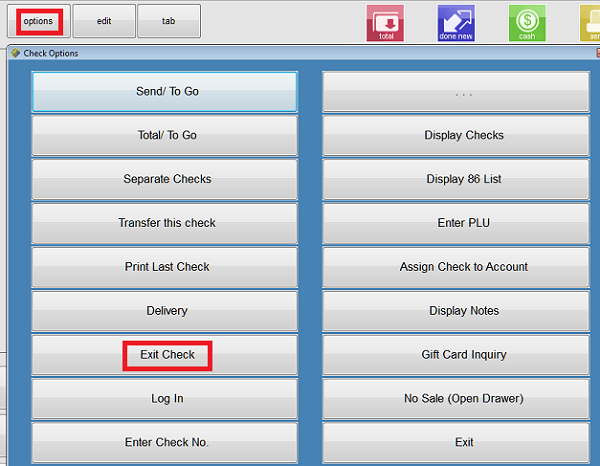 When the quantity is zero, a popup will display when the item is selected in POS. You can change the message that displays at the bottom of the login screen. From the Supervisor Menu select "Enter Login Message of the Day". Make sure that the check is not open on another workstation. If the same check is open twice, the check will not save properly. Make a note of the check number and go to "Unlock Check" in the Supervisor Menu. Enter the check number at the prompt. A popup will remind you to make sure no one has this check open. The "unlock check" activity will print on the Activity Log. If you have two cash drawers at the same workstation (most restaurants and bars do not) you can assign a cash drawer to an employee. The default or primary cash drawer is assigned in the employee's user ID setup. 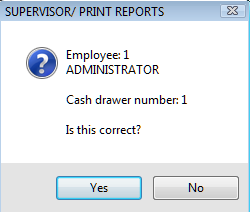 Only the assigned cash drawer will open for the employee when a check is closed or "No Sale" is selected. 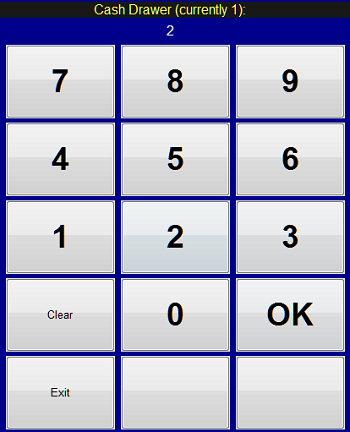 The keypad will show the cash drawer currently assigned. Enter the new cash drawer number and then OK. Most restaurants and bars to not use this feature.